Posted on 22, January 2019 by EuropaWire PR Editors | This entry was posted in Chemicals, Electronics & Machinery, Germany, Industrial, News, Technology and tagged appliance production, Big Data, chemical digitalization, CHINA, COSMOPlat, Covestro, digital transformation, digitalization, digitalization of appliance production, digitalization strategy, Dr. Michael Schmidt, Dr. Ulrich Liman, foam technologies, Haier Group, Haier Institute of Industrial Intelligence, household appliances, industrial automation, insulation, intelligent manufacturing, John Dou, mass customization, monitoring foam quality, polymers, polyurethane foaming, polyurethane technologies, polyurethanes, Qingdao, refrigerator insulation, smart factory, smart production. Bookmark the permalink. 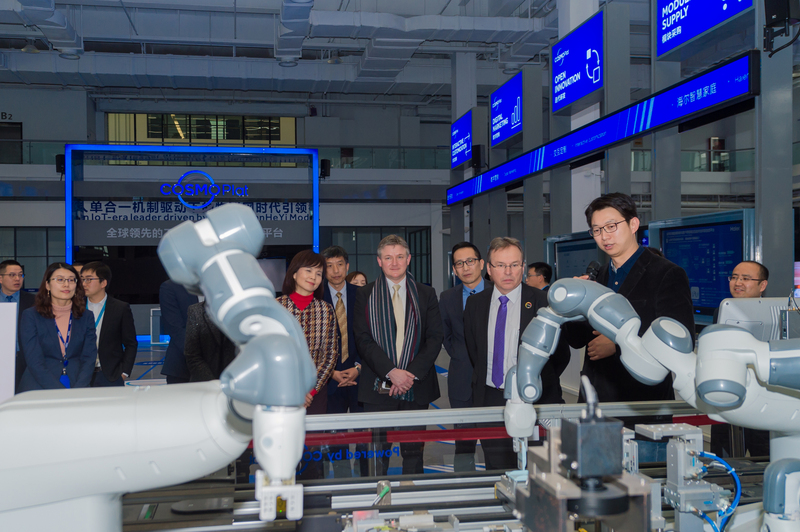 Dr. Ulrich Liman, global head of research and development in the Polyurethanes segment at Covestro, and the representative of Haier are looking forward to the set-up of a joint digitalization lab for refrigerator production. Dr. Ulrich Liman, globaler Leiter Forschung & Entwicklung im Segment Polyurethanes bei Covestro (r.), und der Vertreter von Haier freuen sich auf die Einrichtung eines gemeinsamen Digitalisierungslabors für die Kühlschrankherstellung. 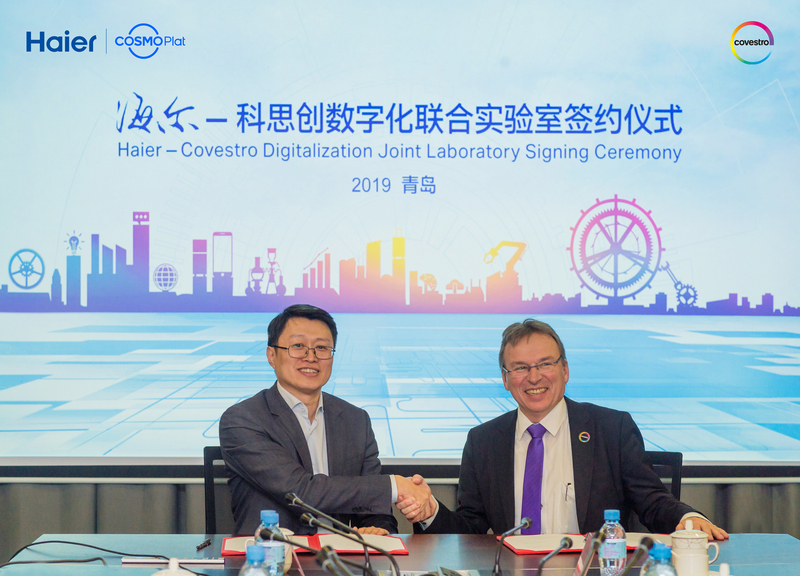 LEVERKUSEN, 22-Jan-2019 — /EuropaWire/ — Covestro, one of the world’s leading polymer manufacturers, and the Haier Group, a major global brand for household appliances, have agreed to set up a joint laboratory in Qingdao, China, for the digitalization of appliance production. The project will be supported by the Haier Institute of Industrial Intelligence. The laboratory will develop digital solutions for using polyurethanes in appliance production – in line with Covestro’s digitalization strategy. The objective is to set a new benchmark for digitalizing the chemical industry. In the new Haier – Covestro Digitalization Joint Laboratory, both partners want to develop innovative solutions for data collection and analysis, monitoring foam quality and process workflows and continuously optimizing processes. These innovative measures will continuously improve the polyurethane foaming and manufacturing process, improve foam quality and reduce manufacturing costs. This will open up new opportunities for the domestic appliance industry in an increasingly digitalized world. To insulate a refrigerator, a precisely dosed amount of polyurethane raw materials is injected into the outer cavity and fills it up completely during foam formation. Both this material and the related foaming process are crucial for the refrigerator industry. All over the world, polyurethane rigid foam is the material of choice for efficient refrigerator insulation. Fully-automated, smart production depends primarily on a precise characterization of the polyurethane components – a complex task. With the development of digital solutions, Covestro hopes to open up new avenues for helping household appliance manufacturers overcome these challenges. With its COSMOPlat internet platform, Haier wants to realize the transformation from mass manufacturing to mass customization of refrigerators. Covestro supports the project with its expertise in chemical digitalization. Mit seiner Internet-Plattform COSMOPlat will Haier die Umwandlung von der klassischen zur kundenspezifischen Massenfertigung von Kühlschränken vorantreiben. Covestro unterstützt das Projekt mit seiner Expertise in der Digitalisierung der Chemie. Dr. Michael Schmidt, head of Innovation Asia Pacific at Covestro, leading the R&D team, and John Dou, Vice president of Commercial Operation China, Polyurethanes segment at Covestro, leading the sales team, expect that this innovative cooperation model will further increase synergies between the two companies.